It’s a chaotic world for this year’s honorees, but that’s just how they like it, as they embrace countless ways to spearhead change at their organizations, from shaking up the IT structure to driving technology investments. 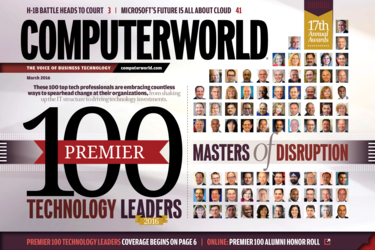 Facts and figures about the honorees’ 2016 budgets, purchasing plans and projects, plus profiles of this year’s Premier 100 Technology Leaders. Free to air their grievances publicly, two former Disney IT workers file lawsuits alleging that the company violated RICO statutes when it replaced them with H-1B visa holders. Preston Gralla says Windows is still the public face of Microsoft, but it’s probably a last hurrah. Microsoft’s future is all about the cloud, he says.